PDATED: Town Talk has changed ownership. Please see this post for an updated review. The next thing you notice is the napkin ring. “Cool,” you’ll think, removing it from your napkin. “It’s one of those thingies”. Before you can remember the name of the thingy if you ever knew it, it will be whisked away by one of the many waitstaff at the diner. The waiters and waitresses wear ill-fitting black jackets, and they are all good-looking hip twentysomethings who will ask you many times, a bit too eagerly, if you liked the food. I get the feeling that tables are not strictly assigned, because I have always been assisted by multiple waitstaff, along with the one main one. They do sort of interrupt your conversation, but you can’t argue with their earnest desire for you to like the Town Talk Diner, and they always make sure you have enough cream, coffee and water, which is good. They even refill tea, which is going above and beyond, in my experience. The food is good. It’s not going to change your life, or become your new favorite restaurant of all time, but it is reasonably priced, and it tastes good. They serve their two plate-sized pancakes with real maple syrup, which you don’t even have to special order, which means someone in the kitchen knows that “pancake syrup” is crap – a very good sign. The pancakes themselves are actually cooked all the way through, which is such a difficult thing in restaurants. If you don’t feel like sweet food in the morning, the goat cheese, spinach, and mushroom omelet will fill you up past lunch time, and it has goat cheese in it. Mmm…goat cheese. In all, I’m glad the Town Talk Diner finally opened its doors. It’s an eager new player in the rapidly growing East Lake Street – oh, sorry, “Midtown” – restaurant scene. It gets a nice solid C+ from me, but the entire club has not eaten there often enough for it to receive the Official Breakfast Club Seal of Approval. PS Please note, this grade has been up-graded. 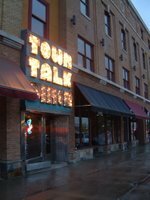 Breakfast Club has gone to the Town Talk diner once, and it received favorable marks from everyone. It is on our list for places to return to, but we haven't done so yet. Loud. I couldn't hear the conversations at the other end of the table - and our group is only 6 people. The sound level coupled with all of the shiny metal sometimes made me feel like I was eating breakfast in a factory - but the kind of factory where everyone is really nice and where someone gives you a really good spicy tempeh melt and you don't have to do any work. I wouldn't mind visiting that kind of factory every once in a while. I second the loud comment. Music was very loud when I went, I asked if they could turn it down and they said: "well...this IS a bar.."
I miss the old Town Talk and what I want to know is that now that it's all fancy and all and doing great business, why can't they keep the beautiful sign looking nice. It's a disgrace, about 40 percent burned out.